With a knee that was starting to feel a lot better, I decided to make the most of having a whole Sunday to play. 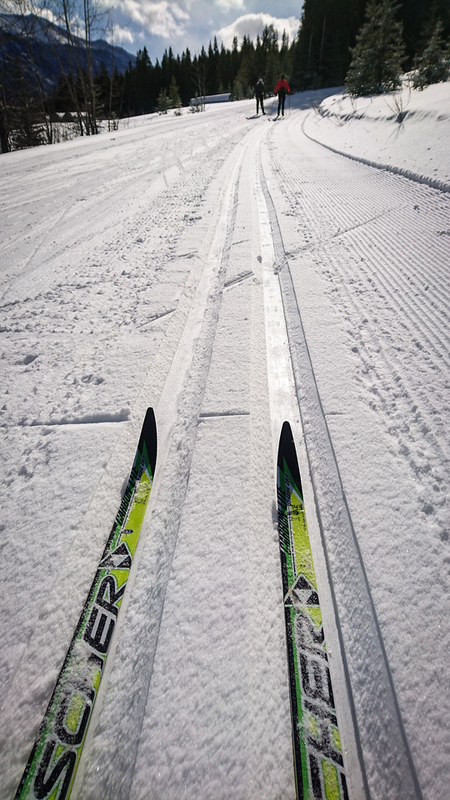 First up was a ski at the Nordic Centre, where conditions were surprisingly pleasant – although would certainly have been better if I was skate skiing. The main plan was to keep Miles company as he hit 1000km of skiing for the season. Next up was loading the fat bike, and then waiting for the road up the pass to clear of crashed vehicles (it had been an icy morning). 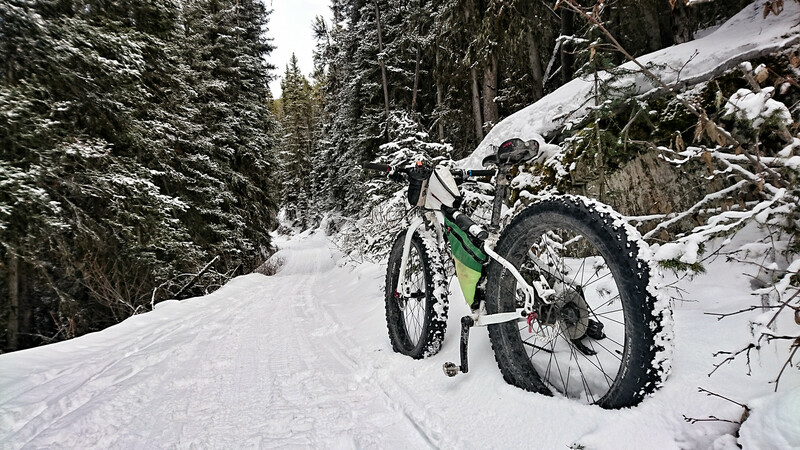 A few centimetres of fresh snow on crust made for pleasant riding and clear tracks. There was no-one much else about though. Two bikepackers coming out from the Spray River, and one guy coming from Banff along Goat Creek, and that was it for the whole afternoon of riding. Just me pedalling along with a knee that felt perfect – meditative bliss. From Banff I headed up along the Brewster Creek trail to Sundance Lodge. Quickly, because I realised I was going to run out of daylight if I wasn’t careful. It was another deserted trail, although in great shape and with plenty of previous fat bike traffic. On reaching the lodge I paused for a minute to eat a snack, then flew off downhill. Hurrying back along Goat Creek the light was getting low. It was silent and deserted, but a beautiful evening. And then I came upon a bull elk standing alone in the middle of the trail. We eyed each other. I asked him politely if he could wander into the bushes so I could get by. And waited. Eventually he wandered off, and I rode by. The descent back into Canmore was achieved with minimal light, but thankfully also minimal traffic. I rolled in the door at 9pm or so, having ridden 92km and still wondering if I should get out and ride another 8km (to make it a round 100km). But I was starving, and out of water, and succumbed the the seductive pleasures of food and warmth – besides, another 8km would have been a contrived addition to a really fun ride. Enjoying your blog. 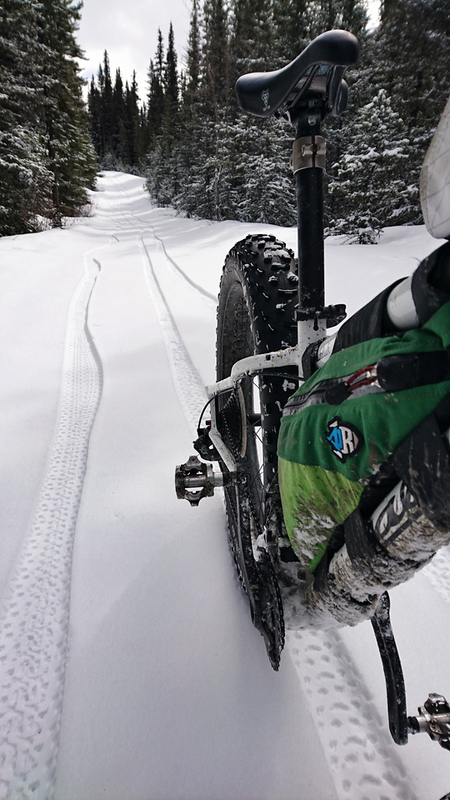 Desperately seeking good fatbiking routes and this sounds amazing. What was your route to get 92km. I know of the Brewster to Sun dance section. Which pass is it you speak of in this post as well as another? What trail is shown in that first picture?? Just wondering where you started from? ThankYou for sharing can’t wait for more snow and some longer rides. Heya Lori – I went from Canmore, up the Spray Lakes Rd (to the ‘pass’ aka Whiteman’s Gap), then down Goat Creek, and up to Sundance Lodge from there. Then I just retraced my steps. The first biking photo was taken on Goat Creek. 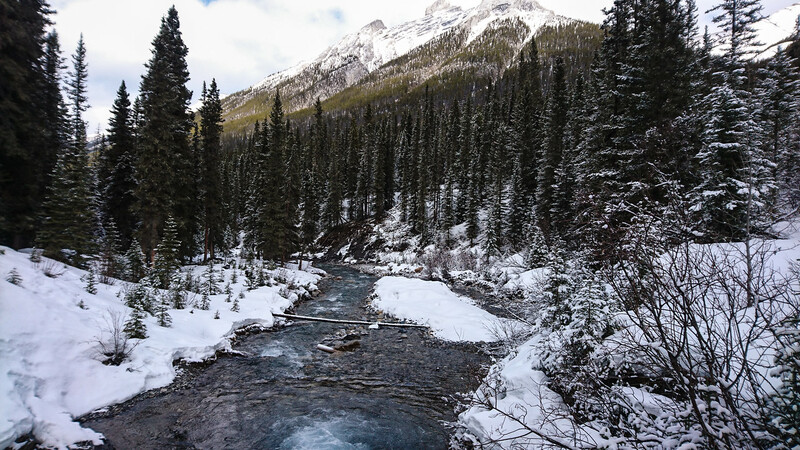 In the past I’ve done the loop around Mount Rundle too, riding through the Nordic Centre and along Rundle Riverside, but the Nordic Centre doesn’t currently allow fatbike access to the trails you need to make the connection to Rundle Riverside.